Contemporary folk music with poetic words and images. Brendan grew up in Killarney, County Kerry, known for it's scenic landscape, traditional music, poets and storytellers. He himself began to write songs and perform them on stage -- any stage. In 1997 he felt a move was to be made; Dublin or New York. He moved to New York in January '97, guitar in hand, and a pocket full of songs. Finding part time work, making enough money to pay the bills, he began performing at open mics. Most notably, Sidewalk Café in the East Village on Monday nights, where it seemed like anyone who owned a guitar was there to play two or three songs. It was a sign up and wait your turn situation. Over time, with a steadily growing following, Brendan went on to play supports in some of the most happening clubs in New York - Mercury Lounge, Arlene Grocery, Bowery Ballroom. Although mostly a solo performer, Brendan would for some shows add a bass player, a cello player and a drummer to create more colour and a bigger sound behind the songs. After receiving rave reviews from his support slots with the Cowboy Junkies, 10,000 Maniacs, and with a growing fan base, in February 2003 he released his debut record, "In the Light", playing to a full house the night of the record release. He toured Ireland twice, in March and April '03, his first time playing back home since he left in '97, and was very well received, playing to full houses countrywide. As the Cleveland Weekly said "Keep an ear and an eye on this talented man!" This album is brillant with a mix of instruments to give a sound that is pleasing to the ear, especially "all fired up" which has both amazing lyrics and some good fast acoustic guitaring. i await to the day of his next album! We love "In The Light"! 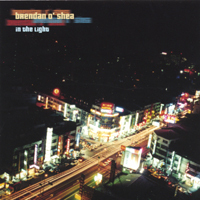 Internet Music Radio, "Gone Fishing for Blue Skies", loves the world of Brendan O'Shea. Songs that will pull on your heartstrings and paint pictures in your mind.Can't wait for the new album to come out. Really nice music! Sweet, melancholic... i love it! What a great album. Hollowmoon and dismantled really stand out for me. A great performer. Saw him down in the Sirius arts centre, cobh a few times. A fantastic buy! FRESH LYRICS, GREAT BEAT, AN IMAGINATIVE STORY TELLER. This album is really special and soulful. Brendan is obviously a great songwriter who sings from the heart. The lyrics to these songs stick with you. A great buy! This album is simply beautiful. Stories come to life and the melodies stay with you all day. Can't wait for the follow up.